The Texas Social Media Research Institute (@TSMRI): Battle for Metropolis, Six Flags Over Texas, and #TXSocialMedia - We Battled for Metropolis and WON!!! Battle for Metropolis, Six Flags Over Texas, and #TXSocialMedia - We Battled for Metropolis and WON!!! The Texas Social Media Research Institute (TSMRI) excited to attend and cover the grand opening of the "Battle for Metropolis" Dark Ride at Six Flags Over Texas on Tuesday, May 19, 2015. This grand opening was one of the most highly anticipated events for the students and board members. The students captured the grand opening moments, engaged with other attendees on social media, and highlighted their experience after the event by creating a video. We also captured our experience by posting pictures on Twitter, Facebook, and Instagram. Two TSMRI Board members (Drs. Jennifer and Tony Edwards) posing for a picture with Six Flags Over Texas Park President, Mr. Steve Martindale. Battle for Metropolis event attendees with an Instagram-friendly (square) portable photo frame. TSMRI Social Media Coaches celebrating the opening of the Battle for Metropolis dark ride with cups of cool, hero-themed soft drinks. TSMRI Social Media Coaches posing for the Battle for Metropolis photo booth with hero-themed props. The event featured an amazing photo booth which enabled guests to become superheroes! TSMRI Social Media Coaches commemorating their Battle for Metropolis experience with a super hero photograph. We are so glad this team invited us to the event! Battle for Metropolis is a fun, phenomenal ride for everyone! Thank you for inviting us to the event! 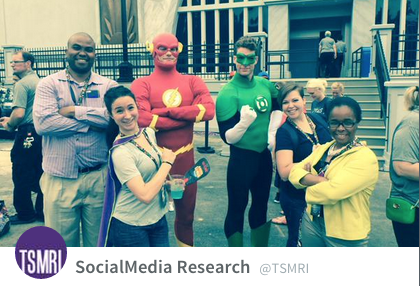 Check out our Storify titled "Six Flags Over Texas - Battle for Metropolis" on May 19, 2015 - #TXSocialMedia.